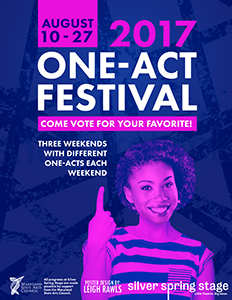 Ingeniously constructed play offers a rare and skillful blending of two priceless theatrical ingredients: gasp-inducing thrills and spontaneous laughter. 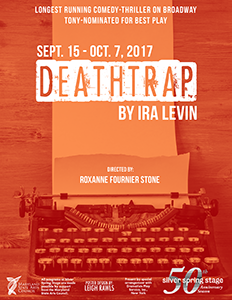 Dealing with the devious machinations of a writer of thrillers whose recent offerings have been flops, and who is prepared to go to any lengths to improve his fortunes, Deathtrap provides twists and turns and sudden shocks in such abundance that audiences will be held spellbound until the very last moment. Believing that lively, contentious debate is the heart and soul of a dinner party, a domestic artist and perfect hostess invite an assortment of opinionated personalities to share a surreal meal. 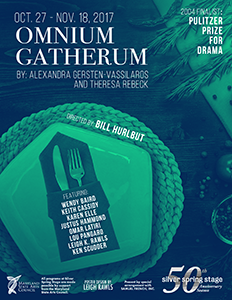 The guests at this exquisite feast of food and argument confront the global implications of September 11 and beyond in an urgent, impassioned, and hilarious work. 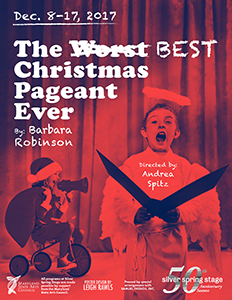 Adapted from the best-selling Young Adult Book, this hilarious Christmas classic of a couple struggling to put on a church Christmas pageant faced with casting the Herdman kids – probably the most inventively awful kids in history. Audiences will delight in the mayhem and fun when the Herdmans collide with the Christmas story head on! 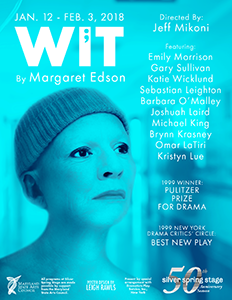 Winner of the 1999 Pulitzer Prize, Wit is a remarkable play both intellectually challenging and emotionally immediate. A renowned professor of English who has spent years studying and teaching the brilliant and difficult metaphysical sonnets of John Donne, has been diagnosed with terminal ovarian cancer. She applies her aggressively probing and intensely rational approach of poetry to her illness and treatment with a profundity and humor that are transformative both for her and the audience. 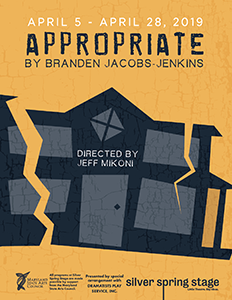 This critically acclaimed, award-winning evening of comedies combines wit, intellect, satire and just plain fun in its portrayal of relationships, language, music, a revolutionary and a Philadelphia twilight zone experience. 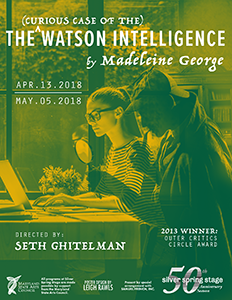 These four constant companions – Watson, the trusty sidekick to Sherlock Holmes; Watson, the loyal engineer who built Bell’s first telephone; Watson, the unstoppable super-computer that became reigning Jeopardy! champ; and Watson, an amiable techno-dweeb who, in the present day, is just looking for love – become one in this brilliantly witty, time-jumping, loving tribute (and cautionary tale) dedicated to the people—and machines—upon which we all depend. 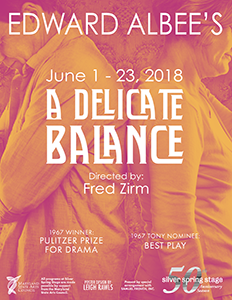 Winner of the 1966 Pulitzer Prize for Drama and a Tony Award winner, this powerful, beautiful play is filled with humor and compassion and touched with poetry. A wealthy middle-aged couple has their complacency shattered when longtime friends appear at their doorstep claiming an encroaching, nameless “fear” has forced them from their own home. Their arrival sets off a firestorm of doubt, recrimination and ultimately solace, upsetting the “delicate balance”. 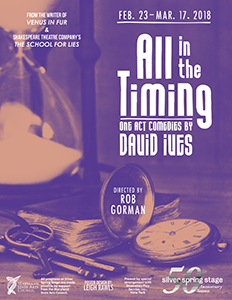 A brilliant play, beautifully fashioned, sometimes wacky and sometimes sad combined with hilarity, poignancy, outrageousness and tragedy. 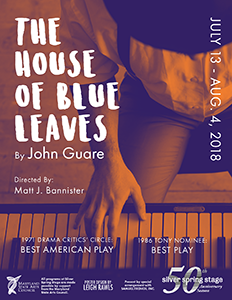 A songwriter with visions of glory toils by day as a zoo-keeper and by night sings at piano bars in Queens, New York where he lives with his wife. Meanwhile, downstairs lives his mistress. Chaos ensues on one day when the Pope makes his first visit to the city, his soldier son Ronny goes AWOL, an old-school chum, now a successful Hollywood producer, shows up with his starlet girlfriend in tow, and a group of nuns all descend on the apartment in this enchanting, zany farce.